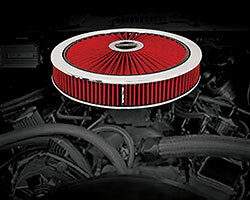 The 14-inch round, by 3-inch high air cleaner assembly has been the go-to performance filter choice for muscle car and pickup truck owners for years. Spectre has added a twist to this tried and true recipe for performance with the introduction of the unique Extraflow Value Pak that includes an Extraflow air filter lid and Spectre High Performance Racing 14” x 3” air filter. A Spectre Performance Extraflow air filter lid increases surface area and allows for more airflow over a standard closed lid. More air can help produce more horsepower and quicker acceleration. Both the Extra Flow air filter lid and HPR filter included in the Extraflow Value Pak are specifically designed to outperform an ordinary paper filter by providing increased airflow for improved performance. Spectre HPR air filters use high quality materials throughout including a pre-dyed synthetic filter media that will not fade, top quality urethane, and steel mesh. 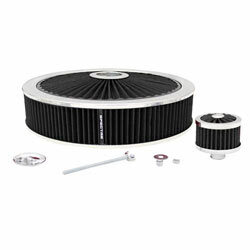 Spectre Performance HPR air filters are pre-oiled and ready to use. The Extraflow air filter lid and HPR 14” x 3” air filter is mounted with the included zinc plated 1-1/4” drop air filter base. This base will fit on throttle body injection assemblies and carburetors with a 5-1/8” neck flange. The entire air cleaner assembly requires just 2.9-inches of hood clearance above the carburetor or throttle body flange. Some vehicle and carburetor combinations may require the use of an air cleaner riser to clear fuel inlets or an electric choke mechanism. If an air cleaner riser is needed, it is available separately by purchasing Spectre Performance part number 4954. To complete the installation of an Extraflow Value Pak Spectre Performance has included an air cleaner stud kit, number 4213, and a special low-profile triple chrome plated air cleaner nut. The unique flush design of the air cleaner nut, number 4208, does not add any extra height to the assembly while still offering easy and convenient tightening or removal. To help close the deal, Spectre Performance has thrown in an Extraflow crankcase breather into the Extraflow Value Pak. The Extraflow push-in breather has a 2” tall filter element, with filter top design, and is 2-3/4” in overall height. The push-in breather is designed for valve covers with a 1-1/4” breather hole. If needed, a grommet is available separately by purchasing part number 5339. The Extraflow push-in crankcase breather is made with the same pre-dyed synthetic filter media as the Extraflow air filter lid and HPR air filter. Currently Spectre Performance offers four Extraflow Value Pak kits in a performance red color media kit, number 847622, a stealth black color media kit, number 847621, a racing blue color media kit, number 847626, or a traditional white color media kit, number 847628. These Extraflow Value Pak kits will provide extra airflow compared to ordinary paper filters and outstanding looks under the hood. Browse all Spectre automotive products by category at SpectrePerformance.com. While you are there use the Products by Vehicle Search to find Spectre performance products specifically made for your vehicle. Spectre Performance products can be purchased through local auto parts retailers, to find the nearest Spectre Performance dealer please click here. Since 1983 Spectre Performance has designed and offered unique, innovative, parts and components to fuel your car or truck obsession. Whether your fixation happens to be a classic muscle car or pickup truck, Spectre will help fuel your passion for performance. Note: The crankcase breather filter is legal in California only for racing vehicles which may never be used, registered, or licensed for use upon a highway. See spectreperformance.com for CARB status on each part for a specific vehicle.